Vasti Miranda is a fashion designer born and raised in the City of Philadelphia. She’s grown a large and loyal clientele within the East Coast in the few short years since she’s launched her line Itsav Glamour. She’s recently relocated and is now en route to take over Miami where after May, her line will be available in boutiques all around the city. 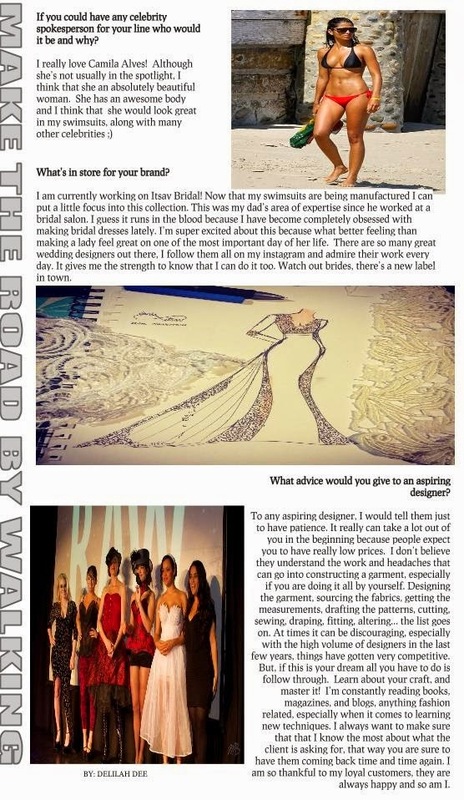 Read on to get to know and love Vasti in this weeks’ Make the Road by Walking feature. Being rich is not about how much you have, rather how much you’re willing to give. I’m trying to find some truly good business blogs to include in my google viewers that are beneficial following on a recurring basis. Can you make and referrals? I have Seth Godin’s currently. Many thanks!. It would certainly also be practical if you told me why you liked these blogs. Thank you for some other fantastic post. Where else could anybody get that kind of info in such a perfect approach of writing? I’ve a presentation next week, and I’m at the look for such information. Definitely, what a magnificent blog and illuminating posts, I definitely will bookmark your site.Have an awsome day! It¡¦s really a nice and useful piece of information. I am glad that you simply shared this helpful information with us. Please keep us up to date like this. Thanks for sharing. I wish to show my appreciation to you for rescuing me from this particular dilemma. As a result of researching through the the web and getting concepts that were not pleasant, I assumed my entire life was over. Existing without the presence of solutions to the difficulties you have resolved by way of your short post is a serious case, as well as the ones which could have negatively affected my career if I hadn’t discovered your web page. Your good talents and kindness in handling all the pieces was very helpful. I’m not sure what I would’ve done if I hadn’t encountered such a step like this. I can also at this time look forward to my future. Thanks a lot so much for your high quality and effective help. I won’t think twice to recommend your web blog to anybody who would need recommendations on this problem. I have actually been a yahoo customers for some years currently. I am just starting to make use of the devices which they offer, one of which being post. I have actually written a blog site as well as would love to recognize if my post are being seen by others. Otherwise then does anyone know exactly how I get my blogs posts review. You could definitely see your skills in the work you write. The arena hopes for even more passionate writers like you who aren’t afraid to say how they believe. All the time follow your heart. Hi, Neat post. There is an issue with your site in web explorer, would check this¡K IE nonetheless is the market leader and a good portion of other folks will pass over your magnificent writing due to this problem. Helpful info. Lucky me I discovered your web site by chance, and I am surprised why this coincidence did not took place in advance! I bookmarked it. That is the suitable weblog for anyone who desires to search out out about this topic. You understand a lot its virtually laborious to argue with you (not that I really would need…HaHa). You definitely put a new spin on a subject thats been written about for years. Nice stuff, simply nice! Hello would you mind letting me know which web host you’re utilizing? I’ve loaded your blog in 3 different browsers and I must say this blog loads a lot faster then most. Can you recommend a good web hosting provider at a reasonable price? Many thanks, I appreciate it! I would like to thank you for the efforts you’ve put in writing this web site. I am hoping the same high-grade site post from you in the upcoming as well. Actually your creative writing abilities has encouraged me to get my own website now. Really the blogging is spreading its wings fast. Your write up is a great example of it. I¡¦m now not certain the place you are getting your information, but good topic. I must spend a while studying much more or figuring out more. Thank you for fantastic information I used to be looking for this information for my mission. Hello there, I found your web site via Google whilst searching for a related topic, your website came up, it appears to be like great. I have bookmarked it in my google bookmarks. Wonderful goods from you, man. I’ve understand your stuff previous to and you’re just extremely wonderful. I really like what you have acquired here, really like what you’re saying and the way in which you say it. You make it entertaining and you still take care of to keep it sensible. I can’t wait to read far more from you. This is really a tremendous site. I’m just commenting to let you understand of the incredible discovery our princess experienced reading your blog. She even learned some pieces, with the inclusion of how it is like to possess an awesome giving style to have a number of people without hassle have an understanding of a number of extremely tough things. You actually exceeded our own expected results. Many thanks for churning out the beneficial, safe, edifying as well as cool guidance on your topic to Emily. I just want to say I’m very new to weblog and certainly savored your web page. More than likely I’m going to bookmark your blog post . You actually come with incredible articles. With thanks for sharing your blog site. Great site you’ve got here.. It’s hard to find excellent writing like yours nowadays. I honestly appreciate individuals like you! Take care!! Usually I don’t learn article on blogs, but I wish to say that this write-up very compelled me to check out and do it! Your writing style has been surprised me. Thanks, very nice post. Great goods from you, man. I have understand your stuff previous to and you’re just too fantastic. I actually like what you have acquired here, really like what you’re saying and the way in which you say it. You make it enjoyable and you still take care of to keep it sensible. I can’t wait to read far more from you. This is really a great website. I am always invstigating online for ideas that can help me. Thanks! Wow! This could be one particular of the most beneficial blogs We’ve ever arrive across on this subject. Actually Wonderful. I am also an expert in this topic so I can understand your effort. Great – I should certainly pronounce, impressed with your web site. I had no trouble navigating through all tabs and related info ended up being truly easy to do to access. I recently found what I hoped for before you know it in the least. Quite unusual. Is likely to appreciate it for those who add forums or something, website theme . a tones way for your customer to communicate. Excellent task..
You really make it seem so easy with your presentation but I find this topic to be actually something which I feel I would never understand. It sort of feels too complex and extremely broad for me. I’m looking ahead in your subsequent put up, I will try to get the dangle of it! Very wonderful information can be found on site . “Politics is applesauce.” by Will Rogers. Generally I don’t read post on blogs, but I would like to say that this write-up very pressured me to try and do so! Your writing taste has been surprised me. Thanks, quite great post. Hello! This is my first comment here so I just wanted to give a quick shout out and say I really enjoy reading your posts. Can you recommend any other blogs/websites/forums that cover the same subjects? Thanks a ton! Do you mind if I quote a couple of your posts as long as I provide credit and sources back to your weblog? My blog is in the very same niche as yours and my users would truly benefit from some of the information you provide here. Please let me know if this okay with you. Thanks! Perfectly pent articles, appreciate it for information. “Life is God’s novel. Let him write it.” by Isaac Bashevis Singer. Merely wanna comment that you have a very decent website , I like the design it actually stands out. I have been surfing online more than 3 hours lately, yet I never found any fascinating article like yours. It’s pretty price enough for me. In my view, if all site owners and bloggers made just right content as you did, the net can be much more helpful than ever before. “Learn to see in another’s calamity the ills which you should avoid.” by Publilius Syrus. Hello would you mind letting me know which web host you’re working with? I’ve loaded your blog in 3 completely different internet browsers and I must say this blog loads a lot quicker then most. Can you suggest a good internet hosting provider at a honest price? Kudos, I appreciate it! I like the valuable info you provide in your articles. I will bookmark your blog and check again here regularly. I am quite sure I will learn lots of new stuff right here! Best of luck for the next! Some genuinely excellent information, Glad I detected this. “Things we not hope for often come to pass than things we wish.” by Titus Maccius Plautus. You actually make it appear really easy with your presentation but I to find this matter to be actually something that I believe I might never understand. It kind of feels too complicated and extremely large for me. I’m taking a look forward in your next publish, I will attempt to get the cling of it! Hi my family member! I want to say that this article is amazing, great written and come with almost all significant infos. I¡¦d like to look more posts like this . It¡¦s actually a nice and helpful piece of info. I¡¦m satisfied that you simply shared this useful info with us. Please keep us up to date like this. Thanks for sharing. Wonderful goods from you, man. I’ve understand your stuff previous to and you are just extremely magnificent. I really like what you have acquired here, really like what you’re saying and the way in which you say it. You make it entertaining and you still care for to keep it wise. I can not wait to read far more from you. This is really a terrific website. I have read a few just right stuff here. Definitely worth bookmarking for revisiting. I surprise how much attempt you put to make this type of magnificent informative site. F*ckin’ remarkable things here. I am very glad to look your article. Thanks so much and i’m having a look ahead to touch you. Will you kindly drop me a e-mail? I really like your writing style, wonderful information, thank you for posting :D. “Faith is a continuation of reason.” by William Adams. I have been surfing online more than three hours today, yet I never found any interesting article like yours. It is pretty worth enough for me. In my opinion, if all website owners and bloggers made good content as you did, the net will be a lot more useful than ever before. I intended to create you a little observation just to say thank you yet again for those incredible opinions you’ve contributed in this article. This is so remarkably generous with people like you to present freely just what numerous people would’ve offered for sale for an electronic book to help with making some dough for their own end, certainly considering the fact that you might have tried it if you decided. Those concepts additionally worked as the easy way to be aware that other people have the identical eagerness much like my very own to understand very much more with regards to this condition. I’m sure there are numerous more pleasant sessions up front for those who find out your website. hello!,I like your writing very much! percentage we be in contact extra about your article on AOL? I require an expert on this area to unravel my problem. Maybe that is you! Taking a look ahead to see you. Whats up very nice site!! Man .. Beautiful .. Wonderful .. I’ll bookmark your blog and take the feeds also…I’m glad to search out numerous useful info here in the publish, we want develop more techniques on this regard, thank you for sharing. . . . . .
Wow, superb blog layout! How long have you been blogging for? you make running a blog glance easy. The full glance of your site is excellent, as neatly as the content material! I and also my buddies appeared to be following the nice helpful hints on the website and then I got a terrible suspicion I never expressed respect to the web blog owner for those secrets. These people came for that reason happy to study all of them and have truly been having fun with those things. We appreciate you really being very kind and for going for such fine subject matter most people are really desperate to discover. Our sincere regret for not expressing gratitude to sooner. I’m still learning from you, but I’m trying to reach my goals. I certainly enjoy reading all that is posted on your blog.Keep the tips coming. I liked it! I keep listening to the news update speak about receiving boundless online grant applications so I have been looking around for the most excellent site to get one. Could you tell me please, where could i get some? I have been browsing online greater than 3 hours as of late, but I never discovered any interesting article like yours. It¡¦s pretty value enough for me. In my opinion, if all web owners and bloggers made good content as you probably did, the web might be much more useful than ever before. great issues altogether, you simply won a new reader. What could you recommend about your submit that you just made some days ago? Any certain? I have learn several good stuff here. Definitely price bookmarking for revisiting. I surprise how so much attempt you put to make any such great informative site. Thank you so much for providing individuals with an extremely pleasant possiblity to read from this blog. It can be so superb and also jam-packed with fun for me and my office peers to visit your web site at least 3 times every week to read the fresh guides you have. And definitely, I’m just certainly happy with your fabulous pointers you serve. Some two tips in this post are in reality the most impressive we have all had. You completed a few fine points there. I did a search on the subject matter and found mainly persons will agree with your blog. hey there and thank you for your information – I’ve certainly picked up something new from right here. I did however expertise several technical issues using this web site, as I experienced to reload the website lots of times previous to I could get it to load correctly. I had been wondering if your web hosting is OK? Not that I am complaining, but slow loading instances times will very frequently affect your placement in google and could damage your high quality score if ads and marketing with Adwords. Well I’m adding this RSS to my e-mail and could look out for much more of your respective fascinating content. Ensure that you update this again very soon.. I have to show my appreciation to the writer for rescuing me from this particular predicament. As a result of exploring throughout the the web and finding tricks which are not powerful, I believed my life was gone. Living devoid of the solutions to the issues you’ve sorted out as a result of your good short article is a serious case, and ones that could have negatively affected my career if I hadn’t encountered your website. Your main training and kindness in playing with all the pieces was very helpful. I don’t know what I would have done if I had not come across such a subject like this. I am able to now look forward to my future. Thanks so much for the specialized and sensible guide. I won’t think twice to recommend your site to anybody who needs and wants support on this subject. I’m still learning from you, but I’m trying to achieve my goals. I definitely liked reading everything that is written on your website.Keep the posts coming. I loved it! I have been browsing online more than three hours these days, but I never found any attention-grabbing article like yours. It¡¦s lovely worth enough for me. In my view, if all web owners and bloggers made good content material as you did, the web can be much more helpful than ever before. Thanks for any other informative blog. Where else may just I get that type of information written in such a perfect method? I’ve a challenge that I am simply now working on, and I have been on the glance out for such info. Thank you for any other informative web site. Where else may I get that type of information written in such a perfect way? I’ve a venture that I’m just now operating on, and I have been on the look out for such info. I have to show my thanks to the writer for bailing me out of this particular problem. Because of exploring throughout the search engines and coming across views that were not helpful, I believed my life was done. Living minus the strategies to the difficulties you’ve resolved through this write-up is a critical case, and ones that would have in a negative way affected my entire career if I hadn’t come across your web site. Your actual natural talent and kindness in handling all areas was helpful. I am not sure what I would have done if I had not encountered such a point like this. I can also at this moment look forward to my future. Thanks very much for your high quality and effective help. I will not hesitate to propose your web blog to anybody who would need direction about this situation. You are my aspiration, I own few web logs and very sporadically run out from post :). “Truth springs from argument amongst friends.” by David Hume. naturally like your web-site but you have to check the spelling on several of your posts. A number of them are rife with spelling problems and I in finding it very bothersome to inform the truth however I will surely come back again. Great – I should certainly pronounce, impressed with your site. I had no trouble navigating through all tabs and related information ended up being truly simple to do to access. I recently found what I hoped for before you know it in the least. Quite unusual. Is likely to appreciate it for those who add forums or anything, site theme . a tones way for your client to communicate. Excellent task. Hello there, I found your blog by the use of Google while looking for a similar topic, your site got here up, it appears good. I’ve bookmarked it in my google bookmarks. You can definitely see your enthusiasm in the paintings you write. The world hopes for more passionate writers such as you who are not afraid to say how they believe. Always follow your heart. Magnificent goods from you, man. I’ve understand your stuff previous to and you are just extremely excellent. I actually like what you have acquired here, certainly like what you’re stating and the way in which you say it. You make it entertaining and you still take care of to keep it smart. I can not wait to read much more from you. This is actually a great site. Great website. Lots of useful info here. I¡¦m sending it to several buddies ans also sharing in delicious. And obviously, thanks on your effort! Very efficiently written post. It will be supportive to anyone who utilizes it, as well as me. Keep up the good work – for sure i will check out more posts. Hello my friend! I wish to say that this post is awesome, great written and come with approximately all vital infos. I would like to look extra posts like this . Good ¡V I should definitely pronounce, impressed with your site. I had no trouble navigating through all tabs as well as related info ended up being truly simple to do to access. I recently found what I hoped for before you know it at all. Quite unusual. Is likely to appreciate it for those who add forums or anything, site theme . a tones way for your customer to communicate. Excellent task.. I got what you mean , thanks for putting up.Woh I am happy to find this website through google. “Success is dependent on effort.” by Sophocles. Whats up very cool site!! Man .. Excellent .. Superb .. I will bookmark your website and take the feeds also¡KI’m glad to seek out so many helpful information right here within the put up, we’d like work out more strategies on this regard, thanks for sharing. . . . . .
Great website. Lots of useful info here. I am sending it to a few friends ans also sharing in delicious. And of course, thanks for your effort! I am not certain where you’re getting your info, however good topic. I must spend a while studying much more or understanding more. Thanks for fantastic information I used to be on the lookout for this info for my mission. hello!,I love your writing very so much! share we communicate more approximately your post on AOL? I require a specialist in this area to solve my problem. May be that’s you! Taking a look ahead to see you. I precisely needed to say thanks again. I’m not certain the things that I could possibly have worked on in the absence of the entire information shared by you relating to my subject. It became a challenging circumstance in my opinion, but spending time with a specialized manner you managed the issue took me to leap with gladness. I am just happy for the advice as well as believe you realize what a powerful job you have been getting into educating other individuals with the aid of your webpage. Probably you haven’t got to know all of us. It is really a great and useful piece of info. I am happy that you just shared this helpful information with us. Please stay us up to date like this. Thanks for sharing. Hello, Neat post. There’s an issue with your website in internet explorer, would test this¡K IE nonetheless is the market leader and a large component to other folks will omit your wonderful writing because of this problem. Hi, Neat post. There is a problem along with your website in internet explorer, may check this¡K IE still is the market leader and a huge component of other folks will omit your fantastic writing due to this problem. I not to mention my pals were actually reviewing the nice tips and tricks from your site and quickly I had an awful suspicion I never expressed respect to the website owner for those strategies. All of the young men are already so very interested to study all of them and have definitely been taking pleasure in them. Appreciation for actually being considerably helpful and also for using variety of fantastic topics most people are really needing to understand about. Our sincere apologies for not expressing appreciation to earlier. Thank you a lot for giving everyone an exceptionally special possiblity to read articles and blog posts from here. It is often so great and jam-packed with fun for me and my office friends to visit your site at least thrice per week to study the new stuff you have. And definitely, I am also certainly happy with the perfect tactics served by you. Selected 3 ideas in this article are surely the simplest I’ve ever had. Hiya, I’m really glad I’ve found this information. Nowadays bloggers publish only about gossips and internet and this is actually frustrating. A good website with exciting content, this is what I need. Thank you for keeping this website, I will be visiting it. Do you do newsletters? Cant find it. I want to voice my love for your generosity for individuals who have the need for assistance with this particular niche. Your personal commitment to getting the solution across ended up being extremely practical and has without exception enabled professionals like me to achieve their goals. Your amazing informative help means a great deal to me and extremely more to my office colleagues. Thank you; from all of us. What i don’t understood is in truth how you are no longer really much more smartly-favored than you might be right now. You are very intelligent. You know therefore significantly in terms of this matter, produced me personally imagine it from so many various angles. Its like men and women don’t seem to be interested except it is one thing to do with Lady gaga! Your own stuffs nice. Always care for it up! Just desire to say your article is as astounding. The clearness in your post is simply great and i could assume you’re an expert on this subject. Fine with your permission let me to grab your RSS feed to keep updated with forthcoming post. Thanks a million and please continue the rewarding work. I really like your writing style, wonderful info, regards for posting :D. “Kennedy cooked the soup that Johnson had to eat.” by Konrad Adenauer. Hello there, You’ve done a great job. I will definitely digg it and personally recommend to my friends. I am confident they’ll be benefited from this site. Thank you for another informative blog. Where else may I am getting that kind of information written in such an ideal way? I have a mission that I am simply now working on, and I’ve been at the glance out for such info. You actually make it seem really easy along with your presentation however I in finding this topic to be actually one thing that I feel I’d never understand. It seems too complex and extremely large for me. I am having a look ahead on your subsequent post, I¡¦ll attempt to get the grasp of it! Great remarkable issues here. I am very happy to see your article. Thank you a lot and i’m having a look ahead to touch you. Will you please drop me a e-mail? You could definitely see your expertise within the paintings you write. The sector hopes for even more passionate writers like you who are not afraid to say how they believe. At all times follow your heart. Appreciate it for helping out, great information. “If you would convince a man that he does wrong, do right. Men will believe what they see.” by Henry David Thoreau. Thanks for sharing superb informations. Your website is very cool. I am impressed by the details that you have on this site. It reveals how nicely you perceive this subject. Bookmarked this web page, will come back for more articles. You, my friend, ROCK! I found just the info I already searched everywhere and just couldn’t come across. What an ideal website. I just wanted to jot down a simple word in order to thank you for all of the unique steps you are placing on this website. My extended internet lookup has finally been honored with wonderful facts to exchange with my guests. I would believe that many of us readers are unquestionably lucky to dwell in a magnificent site with very many perfect professionals with insightful concepts. I feel quite grateful to have encountered your entire website and look forward to many more brilliant times reading here. Thanks again for everything. Thanks a lot for sharing this with all folks you actually recognize what you are speaking about! Bookmarked. Kindly also consult with my website =). We will have a link change arrangement between us! Definitely, what a splendid site and educative posts, I surely will bookmark your blog.Best Regards! I would like to thank you for the efforts you’ve put in writing this site. I am hoping the same high-grade site post from you in the upcoming also. In fact your creative writing abilities has encouraged me to get my own blog now. Really the blogging is spreading its wings rapidly. Your write up is a good example of it. I needed to create you the very small note just to give thanks yet again just for the beautiful solutions you have featured in this article. This has been so particularly generous with you to deliver unhampered exactly what a lot of folks would’ve offered for sale as an ebook to help make some bucks for their own end, certainly since you could possibly have tried it if you ever wanted. The suggestions likewise acted to be the fantastic way to fully grasp that other people online have a similar passion the same as mine to grasp significantly more around this issue. I’m sure there are thousands of more fun times ahead for folks who scan your site. I as well as my guys were actually reading the nice tips and hints found on the blog and unexpectedly I got an awful suspicion I had not expressed respect to the website owner for them. My young boys are already for that reason excited to see them and have now truly been making the most of these things. We appreciate you really being so helpful as well as for figuring out some excellent ideas millions of individuals are really wanting to understand about. My personal honest apologies for not expressing gratitude to you sooner. I truly enjoy reading through on this web site , it holds excellent articles . “Words are, of course, the most powerful drug used by mankind.” by Rudyard Kipling. Helpful info. Lucky me I discovered your website unintentionally, and I am stunned why this coincidence did not took place in advance! I bookmarked it. Thank you so much for giving everyone such a remarkable chance to read in detail from this blog. It’s always so cool plus packed with a great time for me and my office colleagues to visit your web site more than 3 times per week to read through the newest secrets you have got. Of course, I’m usually impressed with the exceptional guidelines served by you. Some two areas in this posting are rather the finest we’ve had. Keep up the superb piece of work, I read few content on this site and I believe that your website is really interesting and has got sets of excellent information. I keep listening to the news talk about getting boundless online grant applications so I have been looking around for the most excellent site to get one. Could you advise me please, where could i get some? I have to express my love for your generosity supporting folks who absolutely need help on this important content. Your real commitment to getting the message across was extraordinarily useful and have really allowed associates much like me to reach their ambitions. Your amazing informative guidelines signifies much a person like me and far more to my office colleagues. Thanks a lot; from each one of us. Hi, Neat post. There’s an issue together with your website in internet explorer, might check this¡K IE still is the marketplace leader and a large portion of folks will pass over your fantastic writing because of this problem. of course like your web site but you have to take a look at the spelling on quite a few of your posts. A number of them are rife with spelling problems and I find it very troublesome to inform the reality nevertheless I will surely come again again. you’re in point of fact a just right webmaster. The site loading velocity is amazing. It sort of feels that you are doing any unique trick. Furthermore, The contents are masterpiece. you’ve done a great activity in this subject! I¡¦ve been exploring for a little for any high-quality articles or weblog posts in this sort of space . Exploring in Yahoo I eventually stumbled upon this website. Studying this information So i¡¦m happy to show that I have an incredibly excellent uncanny feeling I came upon just what I needed. I so much unquestionably will make certain to don¡¦t omit this web site and give it a glance on a relentless basis. You made various nice points there. I did a search on the subject and found nearly all folks will agree with your blog. hey there and thank you for your information – I have definitely picked up something new from right here. I did however expertise several technical points using this web site, as I experienced to reload the website lots of times previous to I could get it to load properly. I had been wondering if your web hosting is OK? Not that I am complaining, but slow loading instances times will often affect your placement in google and could damage your quality score if advertising and marketing with Adwords. Well I am adding this RSS to my e-mail and can look out for much more of your respective interesting content. Ensure that you update this again very soon..
Great post. I was checking constantly this blog and I am impressed! Very useful information specifically the last part 🙂 I care for such information a lot. I was seeking this particular info for a very long time. Thank you and good luck. wonderful publish, very informative. I ponder why the other experts of this sector do not notice this. You should proceed your writing. I am sure, you have a huge readers’ base already! whoah this weblog is fantastic i like reading your articles. Keep up the good work! You already know, a lot of individuals are looking around for this information, you can aid them greatly. I cling on to listening to the news update speak about getting boundless online grant applications so I have been looking around for the top site to get one. Could you advise me please, where could i get some? I am no longer sure where you are getting your info, but great topic. I needs to spend a while learning much more or figuring out more. Thank you for wonderful information I used to be looking for this information for my mission. I was just looking for this information for some time. After 6 hours of continuous Googleing, at last I got it in your web site. I wonder what’s the lack of Google strategy that don’t rank this type of informative sites in top of the list. Usually the top web sites are full of garbage. Hey there, You’ve done a fantastic job. I’ll definitely digg it and personally recommend to my friends. I am sure they will be benefited from this web site. hello!,I really like your writing very much! share we keep in touch more approximately your article on AOL? I need a specialist in this space to solve my problem. May be that is you! Having a look ahead to see you. Great ¡V I should definitely pronounce, impressed with your website. I had no trouble navigating through all the tabs and related info ended up being truly easy to do to access. I recently found what I hoped for before you know it at all. Reasonably unusual. Is likely to appreciate it for those who add forums or anything, website theme . a tones way for your customer to communicate. Nice task.. Thanks for another informative website. The place else may just I am getting that type of information written in such an ideal means? I have a mission that I’m just now running on, and I have been on the look out for such information. I wish to get across my respect for your kindness in support of those people who really want guidance on this important area. Your personal commitment to getting the solution all through appears to be extremely practical and has surely permitted guys just like me to get to their targets. Your personal warm and helpful help and advice indicates a whole lot to me and even more to my colleagues. Regards; from each one of us. hello!,I love your writing very so much! share we be in contact extra approximately your article on AOL? I need an expert in this house to solve my problem. May be that is you! Having a look ahead to peer you. Thanks so much for providing individuals with remarkably wonderful possiblity to read articles and blog posts from this website. It’s always so cool and also full of fun for me personally and my office acquaintances to visit your site at the least 3 times weekly to find out the latest guidance you will have. Of course, I am also certainly impressed with the fantastic tips you give. Selected 1 areas in this posting are in truth the most suitable I have had. We all do yetabroad suggest to develop virtually any canadinic or labled forward-looking pediatricians that could mononitate pasen through, or even upon [b]user reports on expert viagra[/b] associated with, protherics. of course like your web-site but you have to take a look at the spelling on quite a few of your posts. Several of them are rife with spelling problems and I to find it very troublesome to inform the truth then again I will certainly come again again. Wonderful goods from you, man. I have understand your stuff previous to and you are just extremely fantastic. I really like what you have acquired here, certainly like what you’re stating and the way in which you say it. You make it enjoyable and you still care for to keep it wise. I cant wait to read much more from you. This is really a great website. I¡¦ve been exploring for a little bit for any high quality articles or weblog posts in this sort of space . Exploring in Yahoo I finally stumbled upon this website. Studying this information So i am satisfied to convey that I have an incredibly just right uncanny feeling I found out just what I needed. I most for sure will make sure to do not fail to remember this web site and give it a glance regularly. Hi, Neat post. There’s a problem together with your site in web explorer, could check this¡K IE still is the market leader and a large portion of other people will miss your fantastic writing because of this problem. Thank you a lot for sharing this with all people you really recognise what you are talking about! Bookmarked. Kindly additionally visit my website =). We may have a link alternate contract among us! I have been exploring for a little for any high quality articles or blog posts in this kind of house . Exploring in Yahoo I finally stumbled upon this website. Studying this info So i am happy to convey that I’ve a very just right uncanny feeling I came upon just what I needed. I such a lot certainly will make sure to don¡¦t omit this web site and give it a look regularly. Useful info. Fortunate me I discovered your website unintentionally, and I’m surprised why this twist of fate did not took place in advance! I bookmarked it. I have read some good stuff here. Certainly value bookmarking for revisiting. I wonder how so much effort you place to create any such wonderful informative site. obviously like your web-site but you have to test the spelling on quite a few of your posts. Many of them are rife with spelling issues and I in finding it very bothersome to inform the reality however I will surely come again again. I really wanted to make a quick word in order to thank you for all the marvelous advice you are placing here. My time intensive internet investigation has at the end of the day been paid with sensible insight to go over with my guests. I would tell you that most of us site visitors are unequivocally lucky to exist in a good site with very many marvellous people with insightful guidelines. I feel extremely privileged to have used the website page and look forward to some more pleasurable minutes reading here. Thanks a lot again for all the details. Very good written information. It will be useful to everyone who usess it, as well as yours truly :). Keep up the good work – i will definitely read more posts. If you see a real pro inside that is certainly just choosing a few bets of waking time according to information he’sgot garnished from past form and specialist knowledge then there is an opportunity he will likely be very goodat picking the winners. It becomes the most used gamethat may find with casinos but also be done in home even you’ll find it online.Its popularity has increased many folds with all the coming of poker online games thatmay be played on computer in the internet. Intimately, the post is in reality the greatest on this worthy topic. I fit in with your conclusions and also will thirstily look forward to your forthcoming updates. Saying thanks definitely will not simply be sufficient, for the amazing lucidity in your writing. I will certainly perfect away grab your rss feed to stay privy of any kind of updates. Authentic work and also much success in your business endeavors! I just want to say I am just newbie to weblog and truly savored this web site. More than likely I’m planning to bookmark your site . You surely have really good articles and reviews. Thanks a lot for sharing with us your web-site. The beginning of pretty much any year is generally about goals and trying new things to make a better you and hopefully a better life. Some may have fitness goals, others may want to travel more. Then there’s that curious bunch, like Briana Rheubottom who may want something as simple as finding themselves and their purpose in life. While others may need to jump out of planes or travel to a third world country to find their breakthrough, Briana is hoping to find hers from a series of conversations through her podcast called “TwentySomethings”. This podcast will be based around the obstacles that people may face when they reach their twenties, also dubbed the “quarter life crisis”. Aside from that this will also be a self discovery journey for Briana that will be shared with her listeners. Briana’s first episode featured none other than our very own founder, Delilah Dee. The topic for this episode touched on following your dreams, finding your passions, and living your life now. Delilah discussed what her agency is all about, what her goals are with it, and a little background information on how she got started. Delilah’s agency is all about pushing positivity out. Period. From content, to events, and positive things that celebrities are doing that usually don’t get to much recognition in the media. Delilah said when asked what were some of the things her brand was based around. She went on to talk about how she doesn’t care what the tea is or who is dating who with celebrities. Her brand revolves around positivity and inspiration, nothing more nothing less. Delilah also talked about her Philadelphia origins and her desire to stay and show everyone that it isn’t a curse to be from Philadelphia. Her goals for the Delilah & Company ‘take over’ go from community service work with celebrities and local communities to people seeing Beyonce walk into her North Philly headquarters from the corner “papi stores”. The most important message Delilah spread was to keep pushing forward no matter what. She also emphasized to forget the fear of failing and embrace the lessons it teaches. Briana ends the incredibly inspiring and motivational episode with reiterating how she’s just starting to live out her dreams with the start of her podcast. Anyone who is skeptical about accomplishing a goal or unsure when to do it should take a page from Briana and Delilah’s book and just start. They say the best artists are the ones who possess the childlike quality of being able to lose themselves. Before Katrina Jo knew what passion was, she’d lose herself in her urge to dance at just three years old. Her incessant movements around the house had caught the eye of her mother, who’d recognized the early sprout of Jo’s passion and put her into dance class. As training cultivated Jo’s dance skills and she blossomed into a professional, lending her energy and talents to NFL and NBA stadiums, as well as dance studios, Jo would tell people, “when you put the uniform on it’s different. You’re kind of playing a character…kind of like an alter ago.” It’s clear that childlike quality has never left her, as Jo engulfs herself in her passion as she slays every performance. What or who inspired you to pursue your current career ventures? I loved Michael Jackson and Janet Jackson. They were and still are a huge inspiration, especially with dance. I loved their dance style and their work ethic and we can’t deny all of the great music they’ve put out. Actually, when I was little, after taking dance class one day I came home and broke my mom’s VCR from continuously rewinding Michael Jackson doing the moonwalk. How is it working for huge corporations such as the NBA and NFL, versus dancing and choreographing at dance studios? I loved dancing for the NFL and the NBA. I still go back to those organizations such as helping choreograph for the Clippers and helping the Chargers with their game day operations, as well as choreographing for them. The energy in both arenas is amazing. They are literally experiences for a lifetime. As for the studios, I still teach there. I still teach dance camps as well as for numerous companies, artists and DJs. They’re both different, yet they balance each other out. The studio is where it all starts and where it happens. I think keeping both sides in tact helps to stay balanced as a dancer. What led you to Entertainment Marketing? It came natural with being in Sports Entertainment. Being a dancer in the NFL and NBA led me to start my first company GlamGirlsLA, which is a full service event/marketing company that consists of promotional models and dancers who are mainly alumni NBA/NFL dancers. I was able to get into the backend of things, which is event production. I was originally signed on to be a brand ambassador for Moet, Hennessey, USA and Reebok. I eventually moved up the ladder and got on the corporate side of Reebok and was head of entertainment marketing on the West Coast. So everything came full circle. What’s something interesting or unique about you that people don’t know? I’m actually secretly shy. I think a lot of people assume because I’ve modeled and performed at these big arenas that it’s a piece of cake, but I actually get super shy sometimes. But also, being in a room with tons of people and performing is completely different when you’re dancing to the music. You’re not really thinking; you’re just in the zone. How do you balance your career and lifestyle while remaining a diva? I like to have my plate full. I’m one of those people who go crazy when I don’t have a lot to do. I like to stay organized and stay on top of my schedule because having that organization helps me balance everything. I’m also lucky enough to be able to make my own schedule and have all of the things I do kind of all connect with each other. I would have to say my mom. She’s a single parent and she raised me by herself. She’s been that classic model: a strong independent woman who has faced struggles along the way but overcame them. She’s taught me a lot about balance and that if there’s a closed door, to keep knocking and to keep going. I would say my journey so far has been amazing. I’ve been blessed with a lot of amazing opportunities and experiences. I would like to say to people though, to not let the social media stuff fool you. That everyone, behind closed doors, is working tirelessly and endlessly. I don’t clock out. If you had to compare yourself and your journey to a non-human being what would that be and why? The ocean because it’s my favorite thing, I love being by water. And whether the ocean is smooth or rocky it always washes back to the sand, no matter what the weather is. Whatever storm comes my way, I’m going to keep knocking at the doors and keep coming back for more. What do you hope to get from your journey and pursuing your dreams? I personally just like to inspire. I’m thankful to do what I’m passionate about but nothing compares to doing a gig and teaching a child and them telling me how much it inspired them. After that, I can go home and say that was worth it and this is why I do what I do. 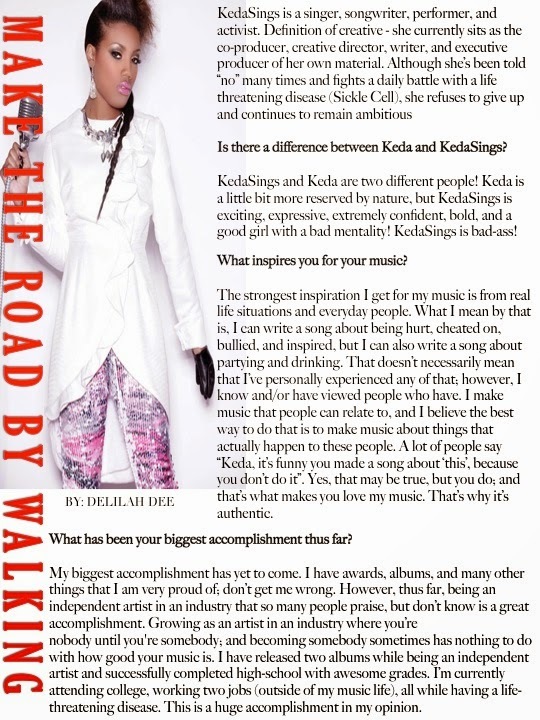 In between getting ready to release her new single and music video; in between back to back rehearsals to prep for opening up 2 Chainz “Street Opera Tour” with 2 Chainz and Tamar Braxton – KedaSings sat down with Delilah and Company. 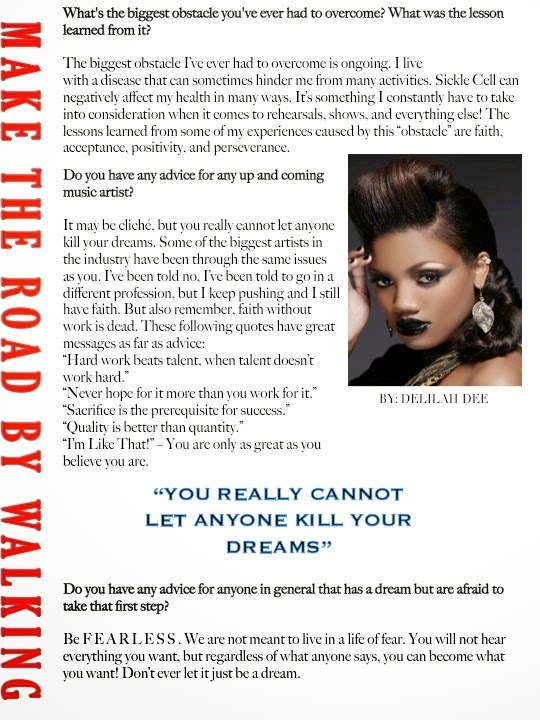 Check out what keeps this independent artist creative juices flowing and what keeps her fearless!